Here is a quick typically American hors d’oeuvre — most of it can be made ahead — just assemble, heat and serve with drinks before dinner. I like to leave the cheese out overnight to soften it and intensify the flavor. Cut the bread into 1/4 inch slices, place on a baking sheet under a preheated broiler. Broil until golden, then turn the pieces of bread over and brown the other side. Cook the bacon in one layer in a frying pan, and let cool on paper towels. Cut or tear into 1/4 inch pieces. 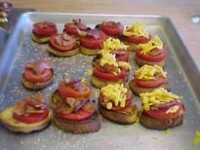 Cut the tomatoes into 1/4 inch slices. Just before serving, place the toast on the baking sheet, cover with a slice of tomato, sprinkle with salt and pepper, put on top several pieces of bacon, and a generous amount of cheese. Place under the broiler until the cheese melts. Serve warm.